Astana: India Fed Cup coach Ankita Bhambri reckons a good serve will be the key on indoor courts when Ankita Raina and Karman Kaur Thandi fight it out with higher-ranked players in the Fed Cup. Thailand's best-ranked singles player is Peangtarn Plipuech, who is placed at 297 while Punnin Kovapitukted is way lower at number 657. "To be very honest, the girls are improving every year. Karman is stronger and fitter while Ankita is also strong and has more experience. They need to put it together," Bhambri told PTI. "It is important to serve well (indoor) and reach out to the ball faster. If you start a point well, the chances of ending it well also get better," Bhambri said. Kazakhstan's World No 43 Yulia Putintseva and Zarina Diyas, ranked 96, would be the tough obstacles for India if they are to top Pool A. "It's always tough to play top-100 players. Ankita had played the match of her life against Yulia last year. That experience should help her," opined Bhambri. Pool B features China, who have World No 40 Shuai Zhang and World No 42 Saisai Zheng, along with Korea, Indonesia, and Pacific Oceania. "The plan and determination are the same. I have always played my best tennis when playing for the country and hope to do the same," said 25-year-old Raina, who is at a career-best rank of 165. "I am not looking at the rankings and focusing on myself and the game I want to execute. Also, I am analysing the opponents' game," she added. Talking about conditions and courts, Raina said, "I am able to adapt much better since I have been here three times before." Bhambri said raising the game at the right time would be important. 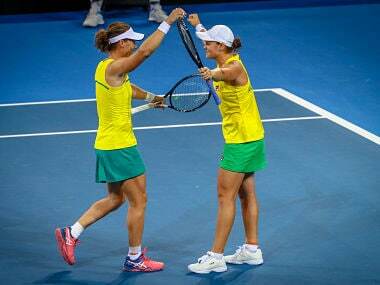 "We had good practice, we hit for 3-4 days and in Fed Cup, anything can happen. You can be favourites or underdogs when you step out, you also step up," Bhambri said. Karman, 20, said she is feeling confident about her game. "Going into the Fed Cup this year, definitely I have improved. I have beaten many girls in top-200 and with top-100 players. I have learnt a lot and hope to get some wins for India," she said.